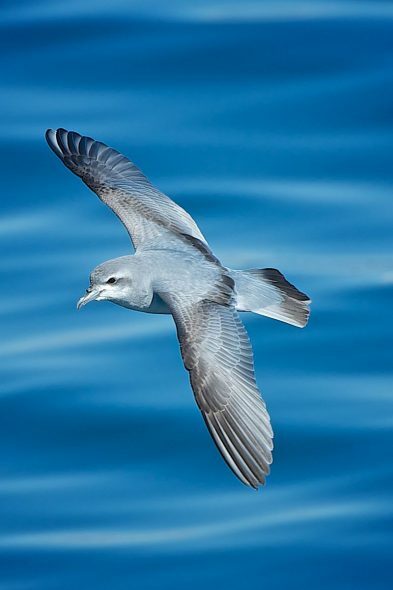 Prions are one of the most common seabirds in the southern oceans. 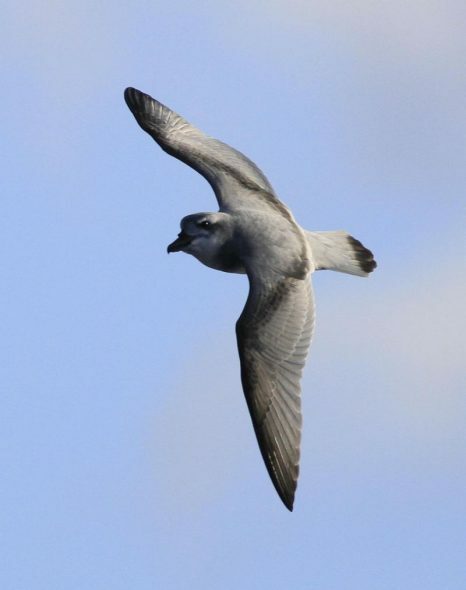 Photo: Fairy prion off Whangaroa, Les Feasey, New Zealand Birds Online. 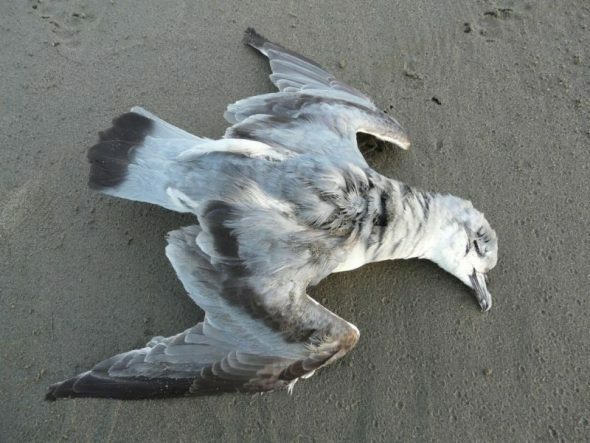 If you see a dead bird on a New Zealand beach it is likely that you have found a prion, as they are the most common kind of bird washed ashore. So why has almost no-one heard of prions and why are many dead on our beaches? Prions are the most common bird washed ashore on New Zealand beaches. Photo: Fairy prion, Waikanae Beach, Alan Tennyson, New Zealand Birds Online. The answer is that prions are one of the most abundant seabirds in the southern oceans, with an estimated 95 million individuals. The huge numbers of prions at sea explains why they are so commonly washed up on our beaches – when they die, their corpses float and so are driven ashore by winds and currents. However, most people seeing them would probably guess that they were seagulls, if they noticed their little blue bodies at all. One exceptional event occurred in 2011 when a quarter of a million prions were driven ashore on New Zealand coastlines by a storm. That event made the popular news in some areas because birds, many still alive, were found at an average of one per metre along many beaches. Prions are like mini-albatrosses and in fact are close cousins of albatrosses – both are a kind of petrel or ‘tubenose’. 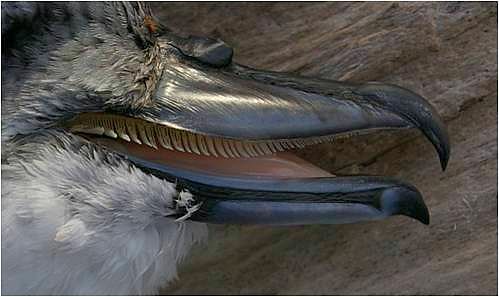 This group of birds has projecting nostrils on the top of their beaks which they use for smelling and tracking down food in the featureless oceans. Petrels spend all their lives well out at sea and most only come ashore on remote islands to breed, which is why most people (except seafarers) never notice them. Prions feed by picking up small animals near the sea-surface, with the larger species filtering plankton, much like baleen whales, using combs in their beaks. All prion species look quite similar but they differ in size and, most notably, in the shape of their beaks. 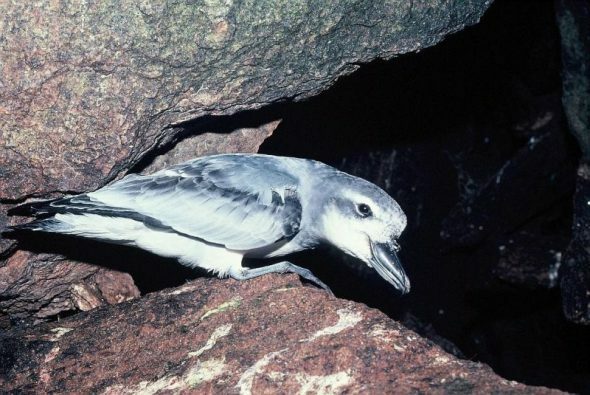 Prions, like all petrels, partly find their prey in the featureless oceans by smell – they have prominent nostrils on the tops of their beaks. Photo: Antarctic prion, Wellington Zoo, Alan Tennyson, New Zealand Birds Online. Lamellae (comb-like filters on the edge of the upper mandible) on a broad-billed prion. Photo: Colin Miskelly, copyright Te Papa. Prions often nest in dense colonies – these holes are fairy prion burrows. Photo: North Brother Island, Colin Miskelly, New Zealand Birds Online. So if prions are so common, why should we worry about them? New Zealand is the centre of prion diversity, with four of six species breeding here, so surely, more than anyone, New Zealanders have a responsibility to look after them. They are apex predators, so sensitive indicators of ocean health. They are appealing looking birds that, despite their delicate-looking appearance, have amazing abilities to fly thousands of kilometres through the roughest waters in the world. However, they are highly vulnerable to human-made changes. Prions can thrive at sea in the wild southern oceans. Photo: Broad-billed prion, off The Snares, Phil Battley, New Zealand Birds Online. In a newly published review of all 135 or so New Zealand’s prion colonies (see Jamieson, S.; Tennyson, A.; Wilson, K.-J. ; Crotty, E.; Miskelly, C.; Taylor, G.; Waugh, S. 2016. A review of the distribution and size of prion colonies throughout New Zealand. Tuhinga 27: 56-80), we conclude that a lack of data on the distribution and number of all prion species severely limits our ability to draw any conclusions about population sizes or to assess current population trends. Most populations have no counts or estimates of their size and we are unsure if the overall numbers of species are stable, increasing or decreasing. We believe that fairy prions (Pachyptila turtur) are the most common prion in New Zealand with a total of roughly 1.5 million breeding pairs – 1.4 million of these being on Stephens Island (Takapourewa) in Cook Strait. Antarctic prions (P. desolata) number somewhere between 350,000 and 1 million pairs, broad-billed prions (P. vittata) number about 350,000 pairs and fulmar prions (P. crassirostris) number 31,000-36,000 pairs. 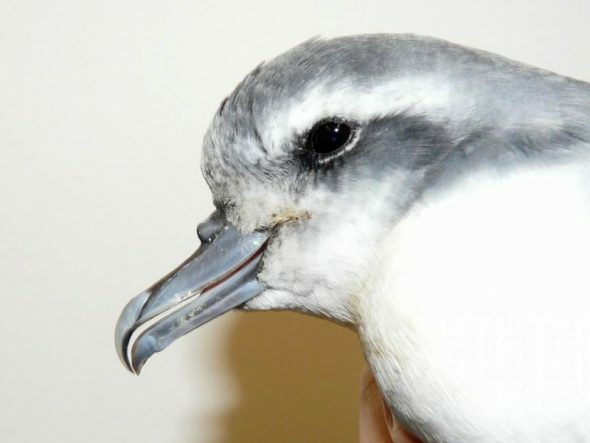 Fulmar prions have short, chunky beaks and are by far the rarest prion species. Photo: Bounty Islands, Paul Sagar, New Zealand Birds Online. The main problem that prions face is introduced predators, particularly rats, cats, stoats and the flightless bird, the weka. Millions of prions have been killed, with many colonies depleted and eliminated, but we have no idea about how many prions there used to be. A colony of fairy prions on Green Island off Stewart Island numbered about 1.5 million pairs in the 1940s but now weka are present and barely any prions remain. 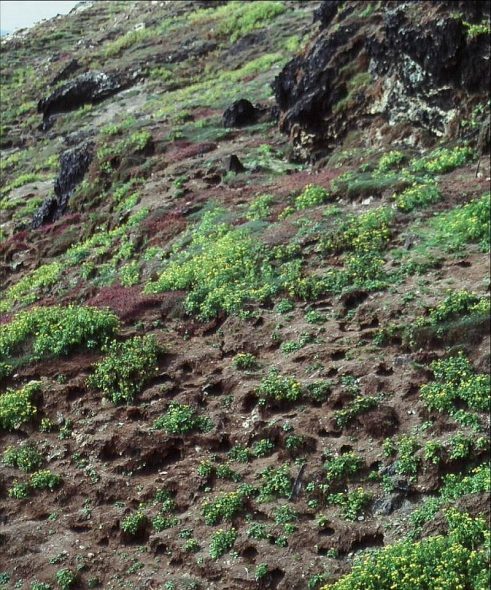 Abundant bones in some caves indicate that fairy prions once had large colonies on the South Island mainland but these are now all but eliminated. 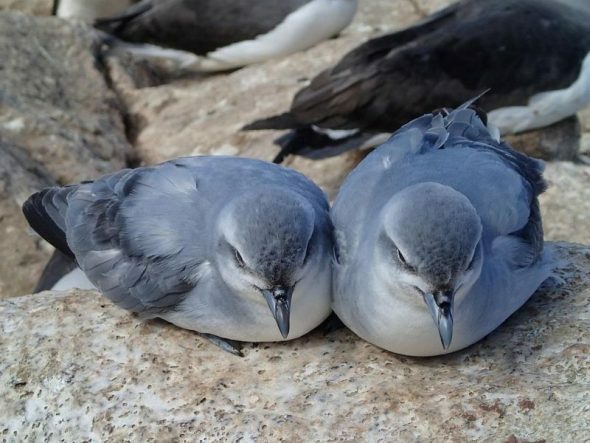 The massive storm-caused prion die-off in 2011 revealed that 100,000s of broad-billed prions once nested somewhere around Stewart Island – we don’t know exactly where they came from and probably never will. Climate-change models forecast an increase in storm frequency and intensity, so these pose another increasing danger to prions. The prion population at The Snares was badly affected when about 200,000 broad-billed prions died in a storm in 2011. Photo: Alan Tennyson, New Zealand Birds Online. Our population review identifies a range of colonies, covering a wide geographic spread, which we recommend should be monitored regularly in order to obtain baseline data and begin to understand population sizes and trends of prion species. Unfortunately there is no plan to carry out most of these much needed surveys, meaning that the future health of prion populations remains very uncertain. What is the term used when there are stormy conditions and these lovelies end up on our west coast beaches either dead or near dead please? A “wreck” is the common phrase used in the seabird world. Interesting to hear this, used to work on Bird Island, South Georgia, where we had thousands of breeding prions, clouds of them could be seen feeding in the turbulent water near shore at times. I would love to come and monitor them in NZ! Most interesting blog; I never knew anything about the prions’ existance.